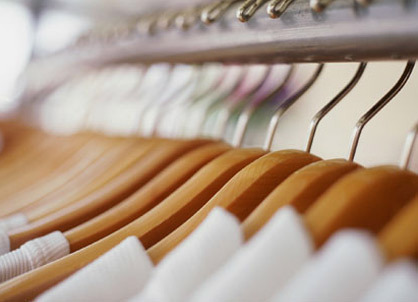 I absolutely LOVE The Fashion Law! 1. I love fashion and 2. I love law. They have the most interesting posts regarding both but what I have shared below is exactly what I thinking about this situation. 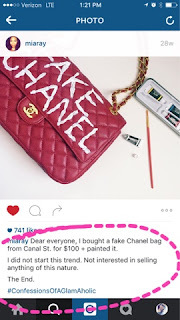 There was a lifestyle blogger last year that purchased a faux birkin and a faux chanel and wrote some words on it. She posted it on her IG page and also shared on Snap Chat how she was going to go about painting words on the faux birkin bag. 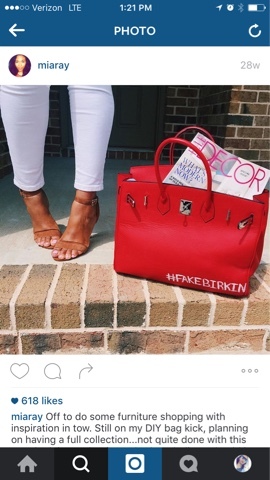 She even puts in the caption that she isn't the originator nor is she interested in selling these bags. Well, I am a long time follower of hers so I don't miss a thing when it comes to her posts. Shortly after she painted her faux birkin, she shared via Snap Chat that Sonique Saturday had emailed her asking her NOT to paint her bags. "Her" being Mia Ray (as seen in the screenshot on the right) and "bags" being the actual bags that Mia purchased with her own coins. The audacity! If you are not familiar with Sonique Saturday, it appears that she began painting bags with hip sayings and selling them via her site but promoting them on social media. You may have even seen Amber Rose, Megan Good, Mona Scott Young and a few other celebs carrying one of her bags. But did she create the trend or the concept? No. She did not. She is not the first and she certainly won't be the last. I even purchased a faux chanel and asked my bff to trash it with paint! Now, Sonique is challenging Gucci because of this bag (below) carried on the runway during NYFW. Sonique's beef with Gucci may be a little far fetched but it is definitely getting her some publicity. The Gucci revamp is officially complete. 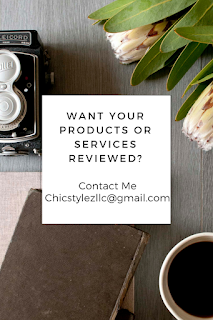 With its garments dominating all of the recent magazine covers and editorials, appearing in the majority of recent street style photos, coming in full force at red carpet events, and landing a significant number of the looks in Beyonce’s recent Formation video, the house also has sales growth to report. In case that’s not enough, artists are coming out of the woodwork attempting to claim some part of the brand’s success. That’s when you know Gucci has made it (again). Case 1: On the heels of the brand’s S/S 2016 collection, which was staged in September, Fashionista reported that Bijules, a New York-based fine jewelry brand, and Jules Kim, the brand’s designer, kicked up a fuss, alleging that the Florence-based brand copied their nail rings. Kim told the publication that she planned to file a copyright infringement lawsuit to prevent the famed Italian design house from selling the rings, but one was never filed. 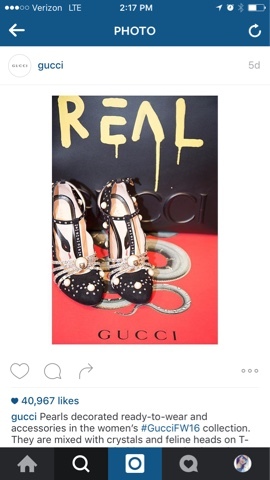 Case 2: Today, a bit of an Instagram war erupted on the heels of Gucci’s Fall/Winter 2016 runway show. 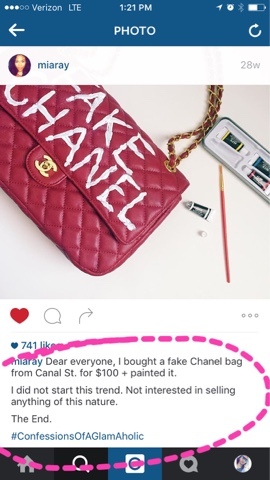 Artist Sonique Saturday took to her Instagram to wage war against the Italian design house for allegedly “stealing” her idea for the “REAL GUCCI” bag that went down the runway, a collaboration with artist GucciGhost aka Trouble Andrew. The artist tagged the brand’s bags with some spray paint - at least one bag contained the word “REAL” on it. You may have also noticed a spray painted registered trademark ® on a jacket – giving the collection a slight legal undertone. It is worth noting that GucciGhost has been tagging Gucci-related items, including handbags, for roughly 10 years now.